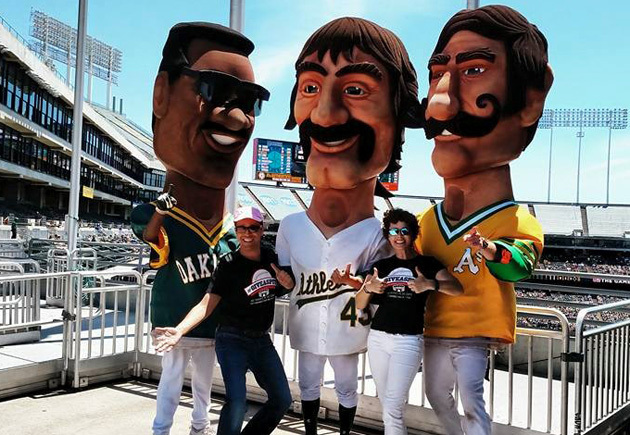 After beating an acute form of leukemia, Jenn Aparicio teamed up with her husband Nestor to try and give back by spending 30 days in ballparks across the nation. Over the past 26 days, Nestor Aparicio has honed his selfie skills in front of busts of Hank Aaron in Atlanta and George Brett in Kansas City. He’s shaken hands with Tommy Lasorda in Los Angeles and posed with a five-foot Q-Tip in Phoenix, Boston and San Diego. He tasted succulent barbecue at Pappy’s Smokehouse in St. Louis, sipped top-shelf tequila at Tommy’s Mexican Restaurant in San Francisco and dressed up in an old-time uniform in Detroit. He forgot to pack his passport before traveling to Toronto, but swayed the customs agent with a photocopy. For most of the trip, his wife Jenn has been by his side. Without her, the journey would have remained a dream. 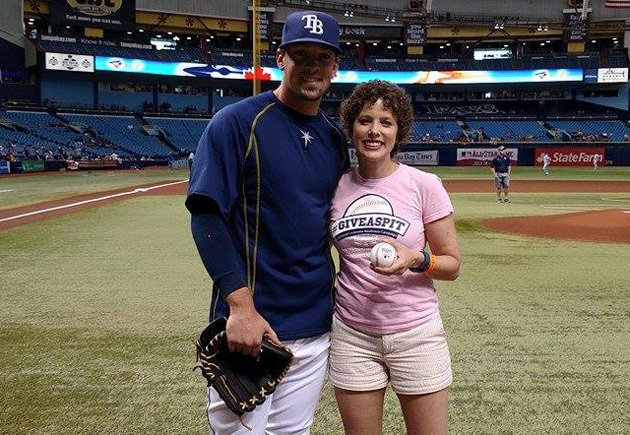 When she was battling an insidious form of leukemia, Nestor couldn’t have envisioned her throwing out the first pitch at a Rays game. Now, it’s just one part of the summer’s travel. The cross-country ballpark trip is dreamt by fathers and sons, college buddies and baseball nerds seeking an escape from everyday life to bear odiferous cars, fast food diets and interminable drives for a lifetime of memories. Sometimes it’s for a cause. Mostly, it’s for vitality. For Nestor and Jenn, it’s both. When the trip concludes Sunday in Cleveland before the grand finale at the All-Star Game in Cincinnati on Tuesday, Nestor will have seen 30 games in 30 different ballparks in 30 days. Sleep has come at a premium. Jenn has occasionally returned home to Baltimore for the occasional checkup and work shifts, but joined for most of the stops. By the end, they will have taken thousands of buccal swabs to submit to the National Bone Marrow Registry. Perhaps one of those swabs will match a leukemia patient needing a bone marrow transplant. Maudlin as it may sound, it’s fair to beg the question: How do you thank somebody for saving your life? It started in February 2014 when Jenn awakened with a red dot on the side of her hand, only to shrug it off and try and ignore the occasional pain. She and Nestor were in Australia to see Bruce Springsteen and bask in a sundrenched vacation that took them from Sydney to the Hunter Valley wine country to Brisbane. They covered 1,200 miles to see The Boss, longer drives than they did in Buenos Aires to see the Rolling Stones or in Germany for the 2006 World Cup, but Fiji awaited after the final show. Hand pain was no reason to call off the vacation. The dot that they suspect was a spider bite grew. It morphed from a speck into a wider, uglier splotch, then a throbbing mass that consumed her fist. The pain only subsided when her hand was submerged in a bucket of ice. First, Jenn thought it was MRSA—the chronic staph infection that infected the Tampa Bay Buccaneers locker room in 2013 and resulted in two retirements and one lawsuit. The cyst slowly healed after she lanced it, but she could barely muster enough energy to go to work after they returned home to Baltimore. She considered it jet lag, but what bout of jet lag could last for several weeks? Then a lump grew underneath her shoulder on the inside of her armpit. Now, she thought it was breast cancer. Jenn arrived at the hospital with Nestor to undergo a battery of tests—a mammogram, an ultrasound, blood work—to determine why even simple maladies weren’t healing, why she’d lost all of her energy, and what exactly was growing under her right arm. The ultrasound revealed two swollen lymph nodes. Her blood work revealed something more sinister. Two days after her tests, she was instructed to see a hematologist. After arriving for her appointment, she didn’t leave the hospital for 42 days. The spider bite didn’t heal properly because she wasn’t producing enough healthy white blood cells. The swollen lymph node was another sign of her perilously low white cell count and failing immune system. The diagnosis was acute bilineal leukemia. A 2007 article in the medical journal Leukemia labeled acute bilenial leukemia a “rare disease with a poor outcome.” At its most basic, leukemia is blood cancer. The most common forms—myeloid, T-cell, lymphoblastic—result when the bone marrow produces corrupted strands of blood cells, which limit the body’s ability to fight infection. Those forms of leukemia typically have one population of blasts (leukemia cells). Acute bilenial leukemia is insidious because there are multiple populations of blasts. To put it more simply, instead of a particular population of white cells (say your T-cells) getting affected, several of them (T-cells, myeloid, B-cells) are all compromised. Acute Bilenial Leukemia doesn’t attack part of your immune system, it ravages the entire operation. Any chance of beating the cancer would require at least one aggressive round of chemotherapy to try and eliminate the cancerous cells and enter remission. If successful, Nestor and Jenn had to use the remission period (typically five to six months) to find a match in blood type (just the type isn’t enough, the sample needs to also match 10 genetic markers for the operation to be safe) for a bone marrow transplant once she had enough healthy white cells to do so. After that, she’d undergo a transplant and hope to avoid a graft-versus-host disease, a harmful side effect where the transplanted immune cells attack the host’s body cells. In the 2007 Leukemia study, 16 patients were diagnosed, only six achieved complete remission and two remained cancer free after undergoing chemotherapy and a bone marrow transplant. The odds were against getting to remission, and Jenn estimates that some 70% of leukemia patients never find a match for a transplant. Nestor and Jenn received this news on the same day that Nestor, a prominent Baltimore sports personality who once went by “Nasty,” was slated to announce his return to WNST radio after a nine-year hiatus spent managing the station. With his wife now restricted to a room at Johns Hopkins Medical Center, it made for an unusual return. On the first day, she flatly told him she wasn’t going anywhere. So they agreed to head to social media and make it Nestor’s lead once he was behind the microphone. “When your Uncle Joe was sick, he was just sick,” Nestor says. “We live in an era of social media, so now it’s impossible to disappear. So what was our story going to be for people? She said she wasn’t going to die, so we may as well be positive about things.” Jenn’s blood type was B-positive, so she adopted it as her mantra. Shuttling between the radio station and Johns Hopkins hospital, Nestor delivered Christmas lights and a disco ball to help make the atmosphere a little more "groovy." He brought friends in to lighten the mood, but couldn’t touch or hug any of them. He constantly doused his hands in Purell to prevent any further bacterial exposure. He could lighten the mood, but he couldn’t kill the cancer. “I basically moved in all day, every day. There was just a lot of sickness; there was a lot of blood and a lot of vomit,” Nestor said. Jenn, meanwhile, maintained a smile despite the black bruises that stretched from the bottom of her rear end and around her thighs. The radiant blonde hair that shimmers in her pre-cancer photos fell out in clumps. Despite the exhaustion from having her body blanched with chemotherapy, she was ordered to move around to avoid pneumonia. And she had to always be drinking water. Her Verizon co-workers surprised her with a pee chart that measured how much she drank and how much she expelled. At least it kept a goal in mind. So Nestor started to talk. The outpouring of support was plentiful, but only a proper match would help. Physical gifts were welcome, but unnecessary. What they needed were swabs. Loquacious is one way to describe Nestor, but talkative may be a better compliment. “Nasty” enough to incite a walkout during the Orioles ninth consecutive losing season in 2006 and prominent enough to get around 1,000 people to join him, Nestor believes in the radio. He owns and operates WNST, Baltimore’s first 24-hour sports talk radio station and remains one of the most visible local personalities. So he kept talking. 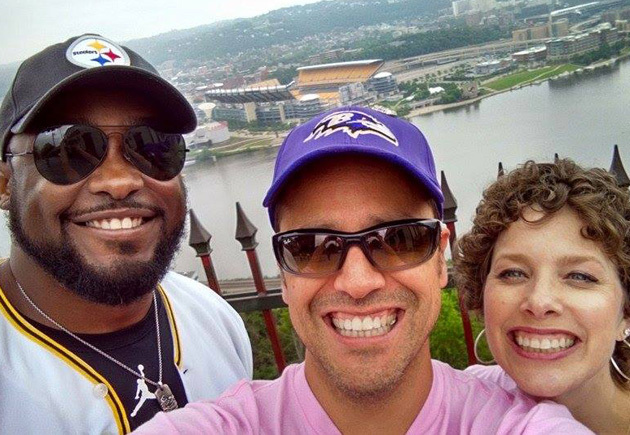 When he organized bus trips for Ravens road games, Jenn was with him. Often, she ran several of them on her own. “I’ve met a lot of people doing this over the years, and if they know me, they know her,” Nestor says. The Ravens reached out to try and help. Nestor called former Ravens defensive coordinator Chuck Pagano, the Indianapolis Colts head coach who survived a treatable form of leukemia a year prior. “In the end, this will be a gift to the two of you,” Pagano told Nestor. Inspiring, maybe. But it was difficult advice to heed even after returning home from her hospital stint. Nestor teamed up with Erik Sauer and Michele Bresnick Walsh, two leukemia survivors who met on the fifth floor at Johns Hopkins hospital and made a pact that if they were saved, they’d start a foundation to assist patients and their families. Sauer was diagnosed when his wife was in the late stages of pregnancy and also caring for a five-year old. He was saved by a German teenager, Bresnick Walsh by a donor from Los Angeles. Their experiences resulted in the “There Goes My Hero” foundation, which seeks to add donors to the Bone Marrow Registry and provide meals and assistance to blood cancer patients and their families. One of the foundation’s core missions is to find potential donors by swabbing. The buccal swab, simply dragging a Q-tip along the inside of the cheek, gathers enough DNA cells to determine blood type and other genetic markers. No longer does a donor need to give blood in order to find a match. Now, they can swab. The process is simple: Grab a Q-tip, swish some water in your mouth for 20 seconds, swab around your cheeks and send the Q-Tip in an envelope to the Bone Marrow Registry. Getting the word out is more difficult. On the second night of her hospital stint, Nestor posed an ethereal life question to Jenn in the hospital ward which they nicknamed "the hotel room.” Her transition from world travel to an indefinite hospital stay was instant, so it was an optimal time to consider the questions that permeate long workweeks and sate natural, human bouts with sadness. If offered "a bucket list," what would you want to check off now? For a couple that met at a minor league hockey game and married six months later, sports were always the mitigating factor for the hard times if Rush or Springsteen weren’t on tour. How else could they enjoy the trips with busloads of Ravens fans, the hordes of drunkards at the Preakness or the hostility of Steelers fans at Heinz Field? For an adventurous couple that had checked off China, Tahiti, Australia and Germany (among others), they had already accomplished plenty. Nestor compiled a similar list as a youngling at Sporting News Radio, so he unearthed the 1994 relic and scanned it to see what he had remaining. He had conquered 22 Super Bowls and plenty of World Series, so one grand event wasn’t enough. Nestor hadn’t crossed off one mad idea, which was to broadcast from 50 states in 50 days. For a couple whose ideal summer evening is watching baseball, 30 ballparks in 30 days was ambitious, but ideal. Nestor continued to hammer away with radio spots, newsletters and Twitter updates. A lifelong Red Sox fan, Jenn saw her sister pose with David Ortiz at Fenway Park with a #JennStrong banner and jersey for the first public campaign. A woman of Polish and Scottish descent, her likelihood of finding a match was increased, but low. Then the good news came anonymously. A 21-year old donor from Germany penned a letter to Jenn, claiming he was motivated to help Jenn because of her acute diagnosis. The transplant was completed successfully, but Jenn needed to avoid complications. 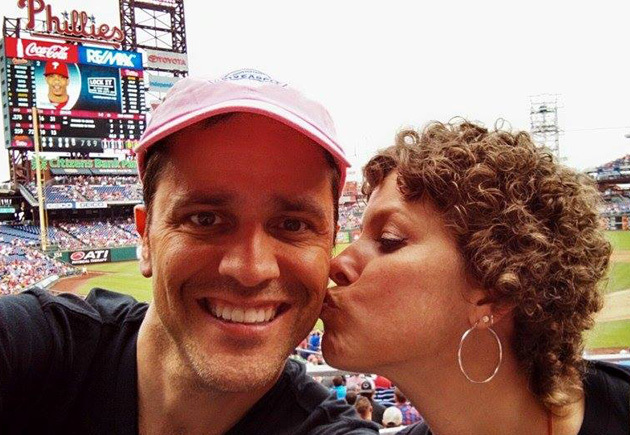 After the transplant on June 26, Jenn was struggling while watching the MLB All-Star Game on July 15. Nestor ran the dates of the 2015 schedule and found a cohesive, if challenging route. They’d start in Baltimore, they’d zig-zag by plane and car, and they’d end in Cleveland before attending the All-Star Game in Cincinnati. Jenn gradually improved throughout August and the decision was final. On February 5, the dates were set. 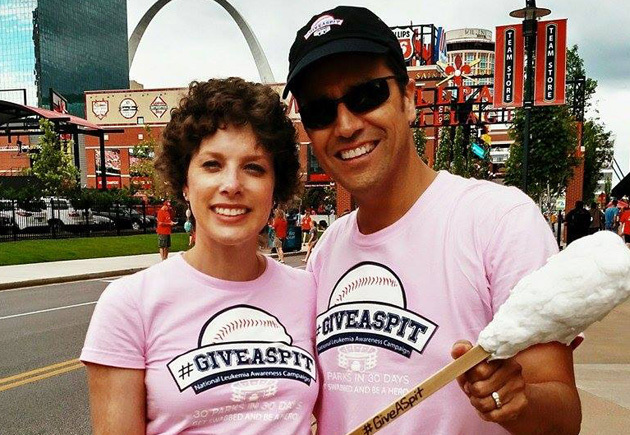 "Be positive" was one mantra, but they agreed on “#GiveASpit” to spread their message through social media. While Jenn admittedly still is not “100%,” she can travel, celebrate with a beer and go to work with more energy than she had upon her return from Australia. And she can visit leukemia patients to remind them that there is a chance of survival, no matter how grim the diagnosis. Nestor’s guests for the trip have included Pittsburgh Steelers head coach Mike Tomlin, ESPN NFL guru Adam Schefter, Jack Harbaugh (father of Jim and John) and former NFL QB Dan Pastorini. Before it started, he enlisted John Harbaugh, Chuck Pagano and Washington Capitals owner Ted Leonsis to support the campaign. One of the advantages of being a visible (if notorious) sports personality are the connections, and Nestor doesn’t just talk, he engages. And Jenn, despite enduring the horrors of a rotting immune system and the taxing treatments to fix it, exudes a confidence and effervescence when discussing her battle. So they kicked off the trip, Jenn driving and Nestor doing live radio from the car, previewing every stadium they’d attend and which home team they’d be cheering for that night. It’s not easy for a Baltimore lifer to put on Pittsburgh gear (Ravens-Steelers enmity runs deep), but a promise is a promise. Jenn joined him in rooting for every team with one exception; no Manchester, New Hampshire native is going to be caught wearing a New York Yankees hat. When they visited New York, Jenn was hosted by the Delete Blood Cancer Foundation, whose mission is to inspire people to join the Bone Marrow Registry. Jenn was chosen to ring the bell at the center of the office, the office celebration when they register a new donor. It was a successful day at the office, so Jenn rung it seven times for seven new donations. On the last ring, Jenn teared up as the office applauded. “Without you, I wouldn’t be here,” Jenn said before offering thanks. Perhaps seven lives would be saved with those donations. Nestor and Jenn exited a few minutes later. Yankee Stadium awaited that night and the All-Star Game, as promised, loomed at the end. Their goal is to meet the German man who agreed to the bone marrow transplant, hug him and tell him what they’ve done to help. Swabs needed to be taken and if they were lucky, a few more people would give a spit. How else can you thank somebody for saving your life?